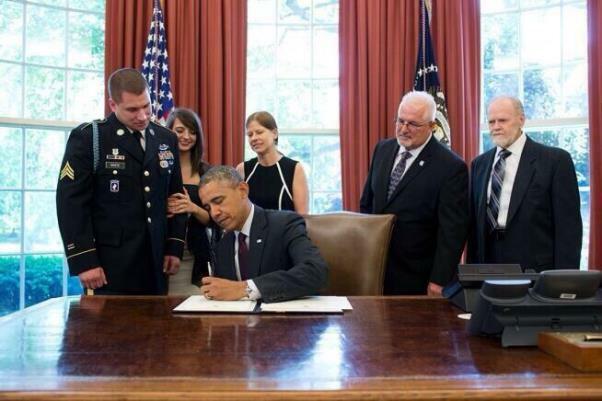 IAM District 751 member Curt White (second from right) looks on as President Obama signs the order awarding his son, Kyle, the Medal of Honor. Also pictured are Kyle’s girlfriend, his mom Cheryl and grandfather Bruce Funk. IAM District 751 member Curt White was filled with pride as he stood in the White House recently to watch President Obama present his son, Kyle, with the Medal of Honor, our nation’s highest military honor. It was a moment Curt wanted to share with his union brothers and sisters, who watched Kyle grow up during his frequent visits to the Seattle flight line. “It was important to share this award with all the veterans who work at Boeing, as well as those members who knew Kyle personally,” said Curt White. Kyle White’s heroic actions took place in November 2009 while serving as a platoon radio operator with the 173rd Airborne Brigade in Afghanistan. He was a 20-year-old Army specialist at the time but demonstrated incredible courage, wisdom and maturity. By repeatedly putting himself in the line of enemy fire, he saved a comrade’s life and helped ensure that other wounded survivors of the attack were evacuated. Kyle White’s squad of 13 soldiers was ambushed by a much larger, heavily armed Taliban group on a steep cliff that provided little cover. Early in the ambush, an enemy grenade knocked Kyle out. He suffered a concussion and was separated from most of his squad when enemy fire hit a nearby rock, sending shrapnel into his face. Kyle was trapped on a cliff facing enemy fire, virtually alone for hours, trying to protect his fallen and wounded comrades. He exposed himself to enemy fire to assist two badly wounded soldiers and used his radio to direct mortar fire at attackers and mark a landing zone for a medical evacuation helicopter. Today, he works as an investment analyst at a bank in Charlotte, NC after using the post 9-11 GI Bill to complete his degree in business administration. Since receiving the Medal of Honor, Kyle has achieved a level of celebrity status – appearing on the David Letterman Show, interviewing with most major networks and even ringing the closing bell on Wall Street.